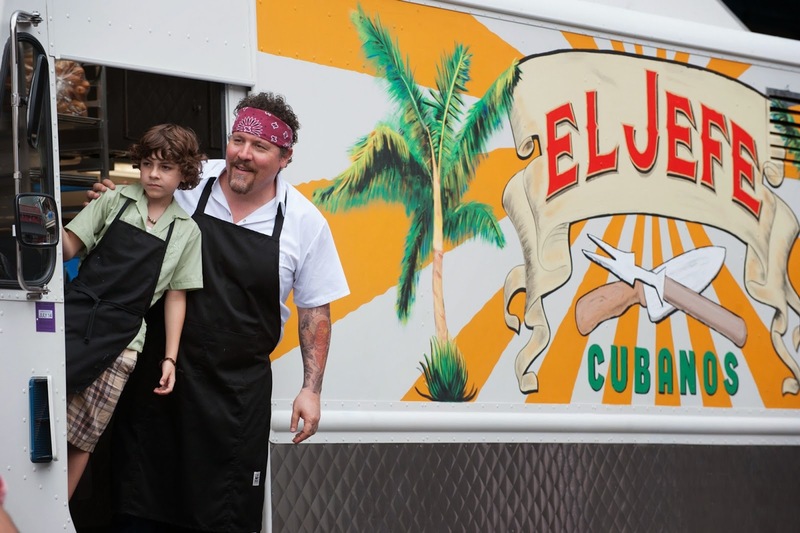 A disenchanted master chef reclaims his love for cooking and his family during a rollicking road trip through some of America’s most mouthwatering food destinations in Chef, coming to Blu-ray Combo Pack, DVD, and Digital HD with Ultraviolet on September 30, 2014, from Universal Studios Home Entertainment. Writer, director, actor Jon Favreau (director Iron Man, Elf) stars in this heartwarming comedy with something on the menu for everyone. The Chef Blu-ray Combo Pack include uproarious deleted scenes, as well as feature commentary from Favreau and the film’s technical adviser and co-producer, food-truck pioneer Roy Choi. John Favreau wrote, produced, directed and starred in Chef. If you don’t like Jon Favreau, you should probably just move along – this is likely not a film for you. Favreau plays chef Carl Casper who works for restaurant owner with no vision played by Dustin Hoffman. Casper was once highly praised by an online food critic (Oliver Platt) and anticipates the critics return. Casper has big ideas for wowing the critic but is told in no uncertain terms that he will cook the safe, tested meals the restaurant has been offering. The critic destroys Casper in his review. The bad review quickly gains popularity and Casper turns to his son Percy (Emjay Anthony) for a tutorial about social media in order to find out what others are saying. After being introduced to Twitter, Casper decides to send a private message to the critic, which inadvertently goes out to everyone. Casper asks the critic to return to the restaurant to see what he can really do. Dustin Hoffman’s character won’t let Casper cook and the critic is served the same dishes he already reviewed. Casper goes off on a rant in the middle of a restaurant about how he works hard and his food matters and he is fired/quits on the spot. This rant goes viral and Casper loses all contacts and credibility in Southern California. His ex-wife (Sofia Vergara) puts Casper together with her other ex-husband (Robert Downey, Jr.) and he becomes the reluctant owner of a food truck. Chef and close friend (John Leguizamo) decide to start with Cuban sandwiches and quickly have a hit on their hands. Casper has clearly had a hard time finding the time to spend with his son and they bond over a road trip from Florida back to California. Along the way, Percy learns to cook, helps promote the business, and father and son bond. Chef is a nice change of pace from the Iron Man – type big budget actions films Favreau has been recently associated with. Is the film terribly clever…no. From the beginning it’s obvious that father and son will bond over food in some way and the disgraced chef will show everyone, especially the critic, what he’s made of. That said, I don’t think a film has to be too inventive to still be entertaining. I enjoyed the short journey Chef Casper and his family took and didn’t mind that everything is neatly wrapped up in a bow at the end. The acting is up to standards and I can think of worse things I could have done with my time. Clearly Favreau called in a few favors and his friends wanted to support his work. The film also includes Scarlett Johansson, Amy Sedaris, and Bobby Cannavale. It’s a sweet story and a nice change of pace for a lot of the actors. It’s not groundbreaking film-making but I enjoyed it. 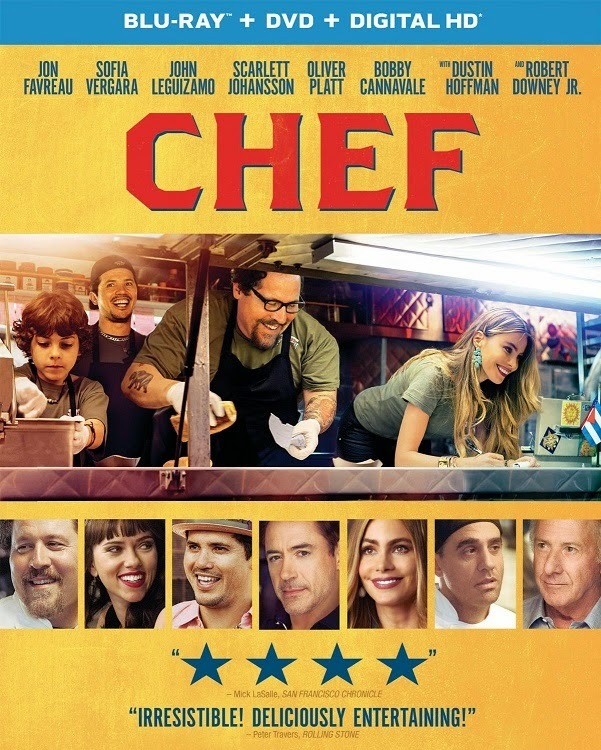 Chef is presented on Blu-ray in 1080p high definition with a 2.40:1 ratio. I had no complaints about detail and clarity and the coloring is also up to par. Skin tones are even and accurate and there are no CGI special features to test the limits of your high definition television. Unfortunately the dirty dingy food truck offers some of the most life like textures. You can almost feel and smell how gross that food truck is before it’s overhauled and cleaned. The DTS-HD Master Audio 5.1 mix is more than sufficient for a film like this. When the music gets pumping at the end, you start to feel the weight of the soundtrack. The listener has a decent sense of ambiance in crowd scenes and for a dialogue driven film, I had no major audio complaints. Subtitles are available in French, Spanish, and English SDH. The list of special features is brief, but I did enjoy the commentary. Feature Commentary – Jon Favreau and Chef Co-producer Roy Choi provide audio commentary which provides information about how the film and the food was created. Deleted Scenes – Seven deleted scenes are available with two funny ones featuring Amy Sedaris. 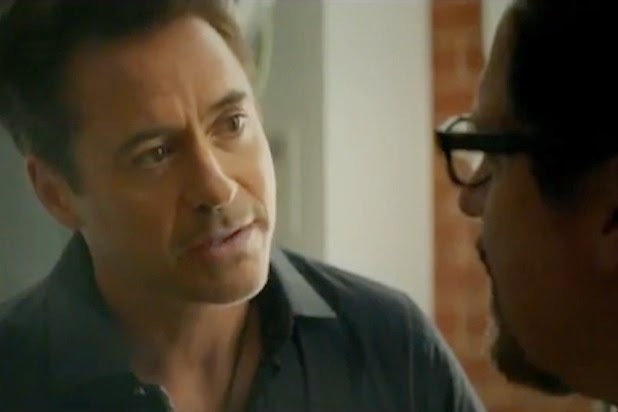 Chef is definitely a low budget (compared to Iron Man) film where Jon Favreau explores his foodie side. The film contains an ensemble cast and with a run time of almost two hours, it managed to hold my attention and interest throughout. The audio and video quality are good enough for a dialogue heavy film and it’s worth a look. Not everything needs to be full of surprises and twists. 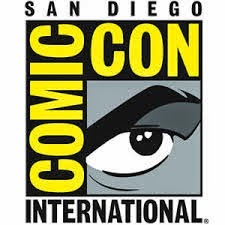 I don’t mind being able to guess where a film is headed. Warning, this film may leave you craving an authentic Cuban sandwich.